This 4-star hotel is located in Hamburg’s Eppendorf district, 5 km from Hamburg Airport and Hamburg city centre. 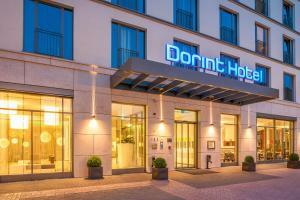 The Dorint Hamburg-Eppendorf offers spacious rooms with air conditioning and flat-screen TV. The soundproofed rooms at the Dorint Hotel Hamburg-Eppendorf feature modern décor and a well-equipped bathroom with a natural stone floor. Each room includes a work desk and an iPod docking station. A full breakfast buffet and selection of international cuisine are served in the stylish EPPO restaurant. Drinks can be enjoyed in Bar Seventy-two with its open-plan layout. The Dorint Hamburg has a 24-hour reception. Guests are welcome to explore the trendy district of Eppendorf with its cafés, shopping boutiques, galleries and bars. Eppendorfer Baum Underground Station is a 12-minute walk from the Dorint Eppen. This offers a direct connection to the Landing Bridges at Hamburg Port.